mama elephant | design blog: April Design Team Stampede! Watch the release round up video below! 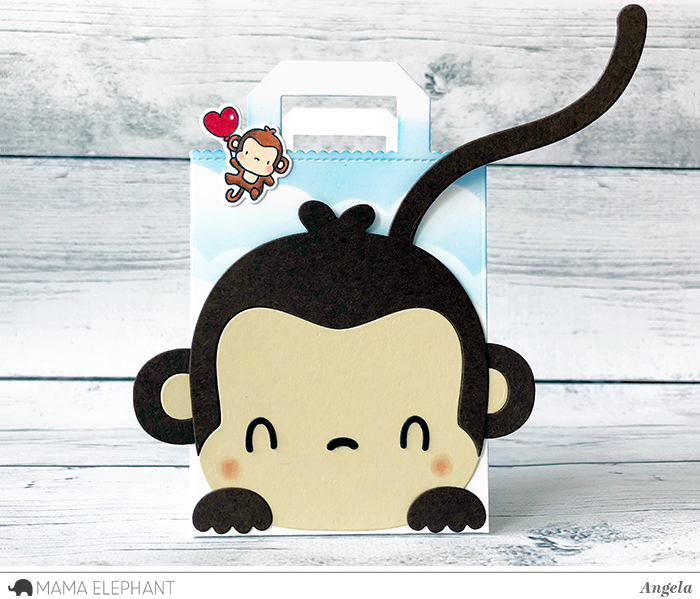 Angela created this cute Monkey Favor Tote by using the new Monkey Favor Bag Accessory and the new Tote Bag 3D Creative cuts! The secret to the long monkey tail is the new Curvy Sliders Creative Cuts! Go ahead! Let's get monkeying around! I am so excited about this release. The monkeys are adorable! The monkeys are so cute. What a fun bag. The details on this die are so cute! Omg...I'm already in love with this super cute monkeys!!!! Great release and I'm loving the new tote bag die! Awesome release and wonderful blog hop...Thanks! Great release. I'm really liking the frames. Love, love, love this release. Immediately went into my shopping cart :) Can't wait to create with the new monkeys! I love this release - especially the frames stamps and dies! So many cute ideas for those. Looking forward to seeing how the designers used the new products. Thank you for the chances to win! I like you on FB and posted about the new release. Sure cute! Love ❤️ the little monkeys. i love your favor bag accessory die sets! that monkey is an awesome addition! I follow you on Instagram & shared. Congratulations on your new release!-Maria Giselle B.
Adore this release! The Little Agenda Frames are my absolute favourite! Cute release. Love the monkeys and the frames. I just stumbled across you guys a couple of weeks ago so this is my first release. I am loving these adorable monkeys!! Such fun products!! Fab release. I've fallen in love with those frames. Shared on Facebook and following on Instagram. Great release. the monkey agenda stamp set is very cute! The bag is so cute. I'd like to make that for my little grandson--I call him my little monkey. I commented on your Instagram (I already follow your Instagram). What an adorable gift bag! Love the die and sweet monkey. Great release! Wonderful release! I love the new addition to the agenda series and the tote bag is just awesome! Another great release! Too many cute things! Can't wait to get them! Thanks for the chance to win a set! I just love Mama elephant and this release is awesome! I love the monkey bag. So cute and fun! I ❤️ monkeys. These new stamps and dies are soooo adorable! Can’t wait to start stamping! The monkeys are my fave!!! Love them! Sweet stamp sets! Congrats on a wonderful release, I have to love those cute monkeys! Love all of the wonderful things that you released this month!!! The monkey is adorable. Very cute and very versatile, thanks for the chance! Such a cute bag - I love how the tail was made using the Curvy Sliders Creative Cuts! I think I have just become a huge monkey fan thanks to all these cute new products ME is releasing. The monkeys are cute - love the tail!! This is one of my favorite release! 1. What amazing release!!! Monkeys are too cute!!! I just love all your inspiration and thanks so much for the chance to win! Those monkeys are the cutest! Another must have of your products! Your products are just too too cute for words!!! Love them ALL!!!!!!!!!!!! Amazing release and wonderful blog hop! Thanks for the inspiration. Such a sweet release! Love the tote bag! Very fun release...can't wait to hop. So many possibilities with the new tote bag die - Love it! Love the gift bag. Following you on twitter and facebook. I love rhat huge, cute monkey on the gift bag. Awww....that monkey is the best! How fun is this adorable bag?!? Love it! The monkey images and dies are ADORABLE!! The little monkeys are JUST SOOOO ADORABLE!! These monkeys and the tote bag are super fun and adorable! I have placed my order already! Oh my !! How cute is that monkey favor tote bag !!?! I’m in love with this monkeys....my husband even wants them! Followed/shared on FB; following already on Instragram and Twitter! Cool release!!! I'm so excited about this release! I can't choose which one I like best! Love these little monkeys! More stamps and dies to add to my wish list. Super cute release, I love those frames and monkeys!!! These stamps and die cut are so adorable! Thanks for the chance to win the giveaway! Yay! Excited to see all the new products in action!